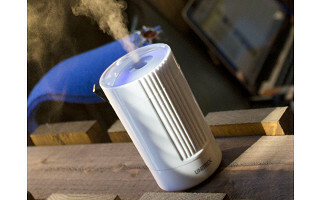 Small, but mighty, the Mistique humidifier delivers 8 hours of moisture-balanced air using just one cup of water. That’s a lot of power for such a sleek little device, especially given how silent it is. Whether you prefer the continuous or intermittent mode, the Mistique is so quiet, it’s easy to forget it’s in even in the room. But you’re sure to notice the benefits. 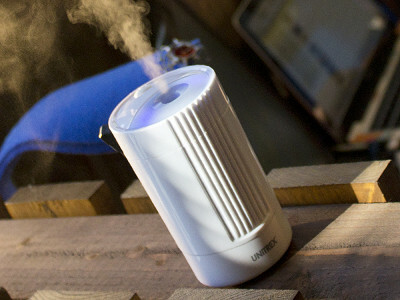 Humidification can help relieve dryness of your skin, nose and throat. Added moisture helps block dust and bacteria from entering nasal passages, a plus during cold and flu season or for allergies and asthma year-round. Lightweight and portable, the Mistique comes with both a power cord and a USB cable so it can go from your bedside to your deskside and back again. In dry climates or during the fall and winter months, Mistique puts healthy moisture-balanced air in the palm of your hand. Hi Grommet, I'm Les and I designed the Mistique to satisfy a need for healthy humidification on the go. Let me share the enthusiasm of more than a hundred thousand satisfied users all over the world. Any questions, let me have 'm. Wonderful idea but I wonder about the one cup of water lasting 8 hours -- does that really change the humidty level very much? @Barbara Hi, yes in your personal space. It is designed for a small area like in the car, on a plane, by your hotel bed. The stream is powerful and adds humidity for at least that long. @Les Can I add essential oils to this to make a aroma diffuser out of this? Does Mistique require purified water? I'm concerned about bacteria growth and how you keep it filtered or clean. I could really use one of these is why I ask. @Julie You may use tap or filtered water. It comes with purifying rods which further enhance the air quality. Cleaning is simple and recommended especially if you have minerals in the water. Just wipe out the container once a week or so with mild dishwashing soap, clean cloth, and rinse. I would love a larger version of this, for my bedroom. Any such plans? @scott Yes, we are the makers of AromaMist, the premier diffuser in the industry. Grommet has their eyes on this for the coming season. @Wendi I say that if that were possible, there would be an umbrella over me and a MaiTai in my hand. The problem is the interior cavity of the Mistique cannot withstand the essential oils. It is strictly for humidity, not aroma. But we specialize in aromatherapy so there is one in the works. I bought something similar last winter that used a bottle of water, which was handy. The problem was that the device had an LED that was so bright, I couldn't stand sleeping in the same room with it, which is when I need the humidifier the most. It looks like this one also has an LED. Can this be shut off, or are there plans for one without an LED? @Beth, good question. There is a very subtle light on this to indicated that the function is working. It is strictly for ambiance and should not disturb you while it is on. Less than a night light, very pale blue illuminate. This would be nice for humidifying orchids in an office window ledge or desktop! @Guest Wish I 'd have thought of that...now calling my florist! Any plans to make one in black? @Diana No, but I have an extra can of shoe polish you can have...jk. We thought about it but the white seems to be clean looking and with a spa-like effect. I don't think white is "spa-like" unless it's in a spa! Any color would be great that doesn't scream, "I'm an appliance." @Diana I see, it's just that I'm surrounded by opinionated women over here. But will take your comment under advisement. We do have some colorful fragrant diffusers that take the appliance look out of it. I understand the USB, and the car adapter for power, but does this use a transformer to wall power or a battery? I am counting up the people who will get one of these from me for the upcoming holidays! Great "stocking stuffer" for the whole family. @Les I have one friend who will LOVE this, who has no computer or iPhone or car . . so for his bedroom, a wall plug is a MUST. I am so excited about him having this that I am ordering it today, ahead of my holiday list. Thanks for answering! @Angelique Oh, one more thing (I sound like Columbo) will you be offering the universal AC adapter through Grommet as an option with the purchase of the unit? 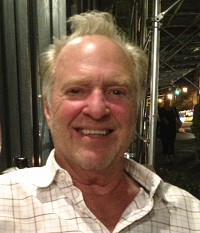 "Hi Les. I have a home water softener and cannot use my tap water in aquariums or to water plants. So I wonder what type of water I would need to purchase – distilled water or spring water or what specific type?" @Matthew So many choices, remember when there wasn't any bottled water? Anyway, use your tap water, spring water, purified water....it's all good. But the water with minerals in them work best as the mist is created by converting them to a healthy steam. Anyway, try them all to determine the best results for you. Still not sure, can this unit be plugged into an electrical outlet ?? @Barbara You need a universal AC adapter. We sell them on line or you probably have one around. They come with iPONEs and such. The are easy to find, normal plug in any wall outlet, and the back of it has an opening for the USB cord which comes with the unit. Otherwise, you can plug into a computer or the convenient automobile adapter which fits into the cigarette lighter opening. Some cars have USB outlets too. Small, but mighty, the Mistique humidifier delivers 8 hours of moisture-balanced air using just one cup of water. That’s a lot of power for such a sleek little device, especially given how silent it is. Whether you prefer the continuous or intermittent mode, the Mistique is so quiet, it’s easy to forget it’s in even in the room. But you’re sure to notice the benefits. Humidification can help relieve dryness of your skin, nose and throat. Added moisture helps block dust and bacteria from entering nasal passages, a plus during cold and flu season or for allergies and asthma year-round.